Project ECSTASY by ATTICO is an absolutely gorgeous collection of furniture. They used solid oak, copper, and Eucharistic hosts to make the collection, which includes a wall screen, a stool, and a dressing table. The collection uses the Eucharistic host for texture, removing all religious association. 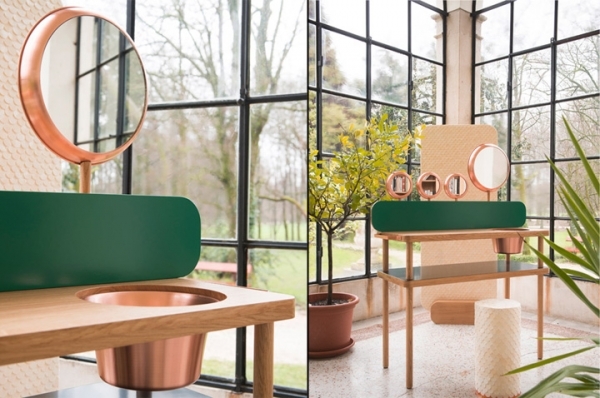 The dressing table has fabulous circular copper mirrors. 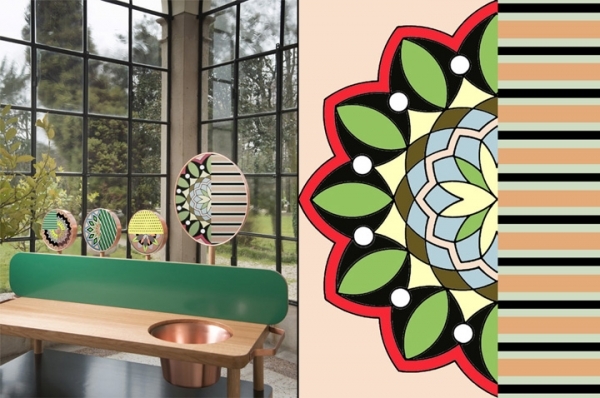 The digital prints on the mirrors are absolutely stunning, adding whimsy, bold color, and a bit of playfulness. A piece of oak, painted green, sits in front of the mirrors, providing the backdrop for this wonderful piece of furniture. A beautiful copper basin sits in the top table area, adding glamour and elegance. 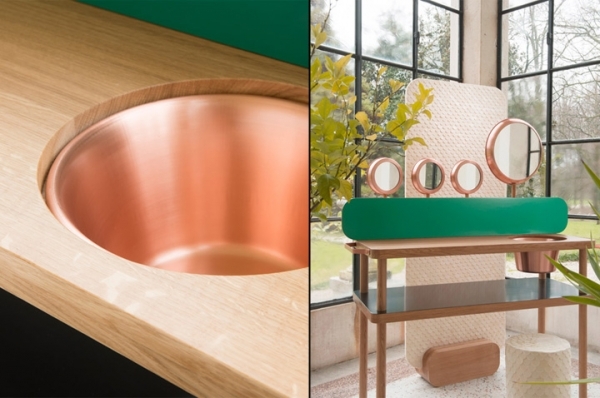 The use of copper is absolutely stunning, it highlights the green and the oak beautifully. Two handles on each side of this dressing table provide simplicity when moving or transporting the table, and slender oak legs provide stability. The two shelves provide ample space for storage, more than enough room for lovely perfume bottles and a beautiful vase full of flowers. The wall screen contains oak and Eucharistic host. The texture provided here is absolutely gorgeous. We love the curved edges of the wall and the stand, matching the curved edges on the dressing table. If you look closely, you can see the indentations in the different pieces of the Eucharistic host, adding even more texture and interest to the wall screen. This is definitely a creative use of material, and a wonderful addition to the collection. The stool has a beautiful circular shape, and it looks absolutely fantastic with the rest of the set. 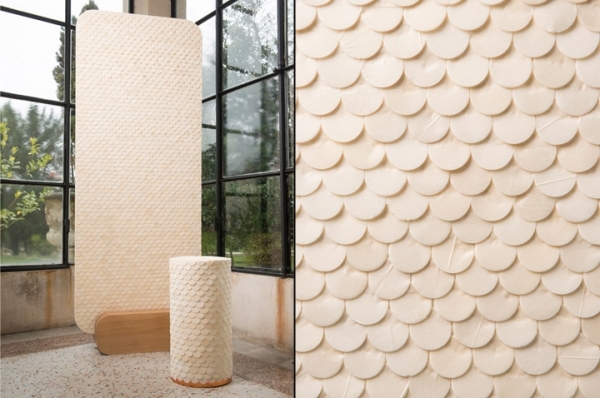 It matches the texture and the formation of the wall screen, putting the unifying touches on this wonderful collection. Collectively, these pieces are uniquely captivating. 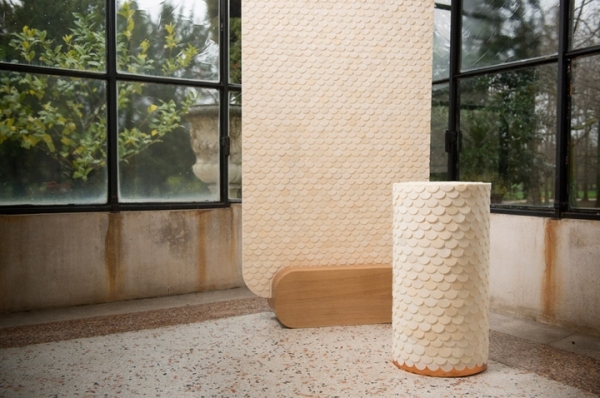 Using an original idea, ATTICO has created a cohesive and beautiful combination of furniture.